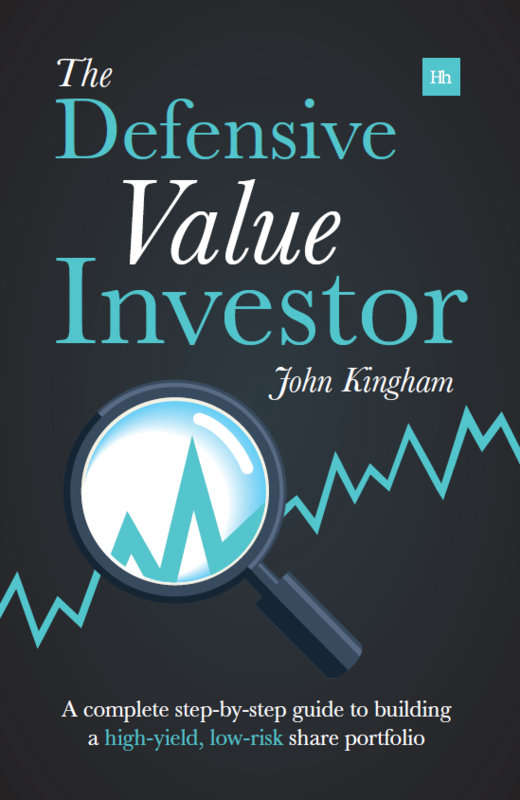 My defensive value model portfolio is ahead of the market by just under 14% so far this year. The reasons are 1) a sensible strategy and 2) some luck. To be honest, the FTSE 100 and FTSE All-Share are not providing much in the way of competition at the moment because both of them have fallen in value this year. The chart below shows the performance from inception of the model portfolio and its FTSE All-Share benchmark, the Aberdeen UK Tracker Trust. 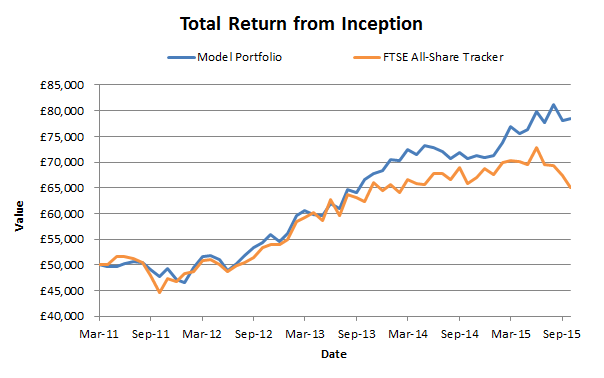 Both the model portfolio and the All-Share tracker are virtual portfolios which started with £50,000 in March 2011. They both reinvest all dividends and take account of broker fees and bid/ask spreads. I have basically all of my family’s long-term savings invested in the same stocks as the model portfolio. Clearly, the All-Share portfolio has not done well lately. At the start of October it was down 3.7% relative to its value in January. In contrast, the model portfolio gained 10% in the same period, producing a relative outperformance of 13.7% year to date. The gap between the two portfolios is now £13,370, which is 27% of their original value. In annualised terms the All-Share portfolio has generated a return of 5.9% per year (including dividends) while the model portfolio has returned 10.3%. One of my goals for the model portfolio is to beat the market’s total return by 3% per year, and that goal is still firmly on track. Another of the model portfolio’s goals is to have a high dividend yield at all times. This goal has always been met since 2011 and the portfolio’s current yield is 4.2%, which compares well with the All-Share tracker’s yield of 3.7%. Dividend growth has also been relatively good too. 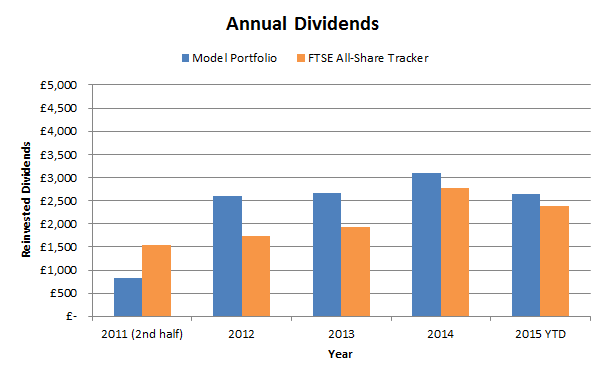 The All-Share tracker has paid out the full 2015 dividend already (of £2,384), while the model portfolio’s cumulative dividend is ahead so far (at £2,650) and still has three months of dividends to go. I fully expect its total dividend to far surpass the All-Share’s by the end of 2015. In terms of individual investments, 2015 has been a bit of an up and down year. Although I realise a sensible investor must expect some individual investments to perform badly, I was somewhat peeved after a string of underperforming holdings during the first half of the year. As you may know I sell one holding every other month and replace it the following month. The idea is to repeatedly replace the “weakest” holding in the portfolio with a stock that has a better combination of defensiveness and/or value. Following that approach I sold ICAP in February for an annualised return of 15% which, while not spectacular, was more than satisfactory. But after that things took a turn for the worse. In April I sold Balfour Beatty – after three years of profit warnings – for an annualised return of 2.6%, which is obviously below par. After that came the sale of Serco in June, which was my worst investment to date and returned a loss of 50%. Next up was August and the sale of RSA, which returned a just-about-acceptable 6% per year. Even that result was largely down to luck and a well-timed exit during a brief share price peak, thanks to the now withdrawn Zurich takeover bid. However, such doom and gloom ended with October’s sale of Cranswick, which you may have read about last week. It produced a record result for the model portfolio, returning 135% in just under three years, for an annual return of 35.3%. And so it continues to be true that some you win, and some you lose. 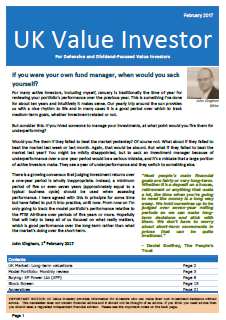 The lesson here is that it is a portfolio’s overall result that matters and not the performance of any one investment. In addition to Cranswick, there have been a couple of really stand-out holdings this year whose performance has been, quite frankly, bordering on the ridiculous. The first outstanding performer is JD Sport, which is up by about 90% from the start of the year. The second is Telecom Plus (trading as The Utility Warehouse), which is up by about 50% from where I bought it in May. After these impressive results the share prices of both companies have reached levels that I would no longer consider attractive. In fact, I am more likely to trim their positions back a bit if their share prices keep going up as they have done recently. The model portfolio is a defensive value portfolio, so risk reduction is as important to me as performance. My main weapon in the war on risk is diversification, diversification and yet more diversification. Company diversification – The portfolio holds 30 companies, with no more than 6% in any one holding. This protects it from problems in any one company. Industry diversification – The portfolio holds no more than three companies in any one FTSE Sector. This protects it from problems in any one industry. Geographic diversification – The portfolio generates no more than 50% of its revenues from the UK. This helps to protect it against problems in the UK economy. One additional line of defence against risk is the portfolio’s focus on defensive sectors. My rule of thumb (which it currently meets) is that the portfolio should always be at least 50% invested in defensive sectors. This focus on defensive sectors helps me to reduce the impact of economic and industry cycles on the portfolio’s capital value and dividend output. Currently the FTSE 100 (and therefore the FTSE All-Share) is attractively valued, relative to both its own historic norms and the current valuations of international indices such as the S&P 500. The fact that the FTSE 100 has recently had a dividend yield of over 4% is a clear indication of this, although the CAPE ratio is my preferred measure of value. With these low valuations I think above average returns are likely from here on out, which means more than 7% a year or thereabouts. Of course that expectation is a long-term expectation, measured over the next five or ten years rather than the next five or ten months. The model portfolio’s goal over that period will be the same as it always is: To beat whatever income and growth the market produces, with less risk. Excellent looking set of results, John. Your dividend yield over the All-Share should be very nicely ahead indeed by the end of the year. Great to see (with the All-Share already totted up) how much greater your dividend income would be on this portfolio. I have recently been tempted by the one-in-one-out cleansing of the portfolio approach. I suspect, though, that I will experiment with a model portfolio first to see whether it is better just to leave alone! We will see, have you also run a model portfolio which has just been left alone (a “control”, if you like!)? If so, be very interesting to hear how the two compare to one another. Hi TDD, Thanks. Hopefully the outperformance won’t be reversed by year end, but with capital gains you can never know. The dividend on the other hand, I’m more confident with. I expect fairly significant outperformance and to me the dividend and dividend growth are the most important factor by a country mile. Hopefully it will only be a few years before the portfolio is generating twice the dividend income of the All-Share, which will be pretty solid evidence that this approach works. As for the one-in-one-out thing, I think it’s the best idea I’ve had. Before I introduced that rule in 2011 I used to sit watching the market every day, but was never quite sure when to buy or sell. Now I have a structure in place and don’t need to watch my investments on a daily or even weekly basis (although I do read RNS updates weekly). I don’t have a control portfolio, although I guess it would be fairly easy to construct one. It would still need to be tweaked though as at least one holding has been taken over and another takeover is imminent; so those would need replacing. Also it’s probably too early (not quite 5-years so far) to see any meaningful differences, and any differences are just as likely to be down to noise or luck than skill or the fitness of the strategy. Having said that it’s an interesting idea, so if I get a bit of spare time I’ll look at putting a buy-and-hold model portfolio together for comparison. Great set of results John and a buy and hold comparison would be a neat idea. he fact that the value of the model portfolio is rising whilst the FTSE is falling shows the strength of the stocks that you’ve added to it. Combine that with the dividends and it’s pretty hard to beat. Hi David, okay so that’s two votes for a buy and hold comparison. As for my portfolio rising while the FTSE 100 is falling, I’m not so sure. It may just be noise although of course I’d like to think it’s down to the quality of the companies. The 5-year review is coming up soon so that will be a good opportunity to look back, compare and contrast, etc. A great set of results. I’m looking Forward to seeing how this pans out over the next year. I agree that the market is still attractively valued and offers some good bargains, although not as good as some of the rock bottom prices which were briefly available in August-September. Thanks TV. Yes some of the bargains of Aug/Sep seem to have vanished but I’m sure there will be other opportunities. Great performance John – Impressive on Cranswick, no doubt if it shakes out at some point you’ll be happy to buy it back on better ratios as it’s a pretty solid sausage. On the CAPE number for the FTSE, have you ever considered taking out the ridiculous falls in the commodities and oily sectors and running a CAPE on the rest, as this might throw up a more realistic figure. The distortions for those two sectors are rather freaky right now and their new valuations may become the norm. Interesting story, and no doubt you have been watching it, on SABMiller and the astonishing price that In-Bev were prepared to pay for it £44 (a price I would never consider paying based on it’s underlying business – however well performing it has been). Still as it was almost inevitable that In-Bev would buy it I did jump aboard at the much lower level (nice to have a little luck I suppose). One thing to ponder in that sector — if SAB is being bought for £44, what on earth could Diageo be bought for? Diageo’s stats are two times Sab, both in terms of it’s ROCE and operating margins. I dare say your value criteria doesn’t allow Diageo to fit into the fold, am I right? Hi LR, thanks. Yes I might well buy Cranswick again if the price halves from where it is today. That’s an interesting idea about pulling out certain sectors, although you’re then getting into the realm of sector CAPEs, which is something I don’t have the data for (yet) and to be honest I’m not super-interested in either. My focus is on a) the overall market and b) individual companies. On SABMiller, I think it’s expensive at £44. With a 1.8% dividend yield you’d have to be looking at a long-term dividend growth rate of 8% or more for it to make sense. That may be possible because that’s what it achieved in the last ten years, but it’s a big ask and requires some optimism. However, for existing shareholders it’s obviously good. Diagio on the other hand, I think is quite cheap. It has a yield of 3.1% and a solid record of growth (although it has flat-lined a bit in recent years), better profitability etc than SABMiller. My style of value investing takes into account a blend of growth/income/quality/value, so for me, on balance, Diageo is something I’d be happy to own at its current price. Hi John, I agree with you on Diageo and it sits at just under 3% of my shrunken wad. It appears you are ahead of some of the professional fund managers and one in particular I’m at a total loss on and that is Neil Woodford’s fund. The fund reports that it is in +ve territory and yet looking at the portfolio I don’t see how it can even be remotely possible given the bulk of the fund was invested in June-July 2014 at the launch. Astra, Glaxo, BAE, Rolls Royce — (all well down); Drax, Centrica(sold at 6 year low), SSE(sold), Allied Minds (smashed in the US); Biotech – big falls again in the US; Babcock – well down on initial purchase, AA (a company that has debts so high that it’s business almost doesn’t matter) — I could go on but the message is the same. It seems tobacco with IMT, BATS, Reynolds are the only real winners. Do you anticipate these trends are reversible, or the stock screening is not astute enough to screen out overpriced and highly indebted companies? I’m guessing that you do look at the progress of it on a regular basis. In short, is this an example of the dangers of hero / crowd following endangering your wealth, or way to early to tell after 1.5 years? I would have to say it’s way too early to tell. Also, share price movements are less important than the dividend yield and dividend growth of Woodford’s fund as a whole. If the yield is say 3% and they can grow the dividend at about 5% (for example) then the long-run return, minus speculative gains/losses (i.e. changes to the yield, PE ratio etc, i.e. changes due to Mr Market) would be 8% a year. The easiest way to do this is to look at the dividend growth rate of the accumulation units. But to do that analysis you need at least four or five years of data. When I reviewed Fundsmith using that approach their accumulation unit’s dividend growth rate was about 12% a year, compared to an 18% a year growth rate for the value of the fund. The additional 6% a year growth in the fund’s value is speculative return that is not sustainable and could well be reversed at some point (i.e. reducing total returns for a while below that 12% growth rate – assuming Fundsmith can keep up that 12% dividend growth rate of course). So I would say wait a few more years before judging Woodford. However, having said that, and looking at his track record going back to 1988, I think it’s fair to say that it’s likely he’ll hit his target of high single-digit total returns over the medium to long-term. Perhaps at that point I’ll do a three-way comparison between myself, Woodford and Fundsmith. The underdog versus the behemoths! Just wondering how you came up with the strategy of selling a holding ‘every other month’ and replacing it the following month and not say, every 6 months? I tried to imagine myself applying your strategy and it made me stressed just thinking about it, haha! I guess you’re a pretty passive investor if you think one sale every other month is a lot! It’s horses or courses I suppose. One trade per month suits me and I only have six buy analyses to work through each year, which isn’t too taxing, or too expensive in terms of trading expenses. But if you’re mostly passive then yes, anything more than one rebalancing per year probably seems like a lot. As for coming up with it, I found that in 2010 I felt like a boat without a rudder, floating aimlessly without a plan for when to buy or sell. I went for months looking at the market every day but not making any trades. I hated it, so I just dreamed up this monthly plan so now I don’t have to look at the market or even think about trading other than in the first week of each month. I do my analysis, make one buy or sell trade, and then I can more or less forget about it for the rest of the month (other than reviewing existing holdings as and when their latest results or updates are published).